A Spanish map of the Florida peninsula drawn in 1527 shows a native settlement called Rio de la Paz near present day Bartow. Little is known about these Native Americans who made their home near present day Bartow, but it is likely that they suffered the same fate as pre-Columbian natives elsewhere – death by European diseases such as small pox and yellow fever. The remnants of these pre-Columbian peoples probably joined Creek Indians who arrived from the north and become the Seminole Indian tribe. The first non-Indian settlement in the area was a colony of Black Seminoles who established Minatti south of Lake Hancock in the late 1810s. These “maroons”, as they were commonly called, were escaped slaves from Georgia and the Carolinas. The Black Seminoles of Minatti were allies of the Red Stick Creek in Talakchopko, near present day Fort Meade. The Seminole leader Osceola had strong ties to Talakchopko, and many of the events leading up to the Second Seminole War were associated with Osceola and the Minatti war chief Harry. By the end of the Second Seminole War in 1842, both Minatti and Talakchopko had been destroyed. The Armed Occupation Act of 1842 facilitated settlement of the Florida peninsula in the 1840s, although the act did prohibit settlement near the Peace River as that was considered Seminole land. 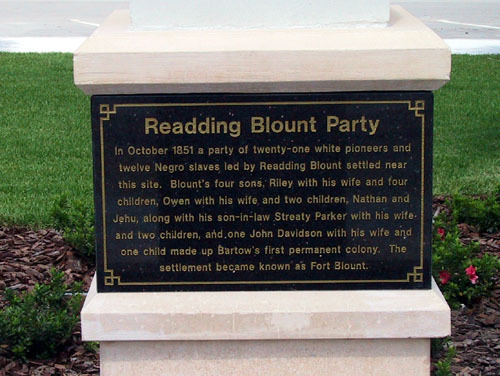 Enforcement of that part of the act was not strictly enforced; however, and settlers eventually moved out of the Tampa Bay area and into the area. As the settlement grew, the residents began to plant citrus trees and build one room school houses and churches. 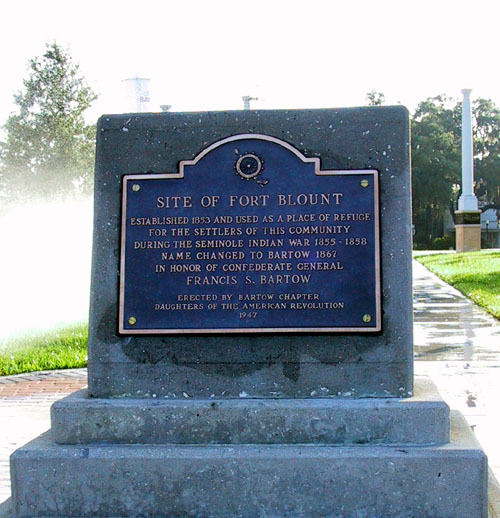 In 1851, Fort Blount was established by Redding Blount just west of current downtown Bartow. At some point in the 1850s, Fort Blount became Peace Creek or Peas Creek, a name dating back to the Rio de la Paz of early Spanish maps. About a month after the secession of Florida in 1861, the state established Polk County from the eastern portion of Hillsborough County. A few months later, the American Civil War began with the Battle of Fort Sumter. Because of the turmoil of secession and the war, the county had no official county seat for its first six years of existence. The state legislature had directed the voters of Polk County to choose a site for the county seat and mandated that the site be named “Reidsville.” During the war, the area’s major contribution to the Confederacy was supplies of food. The Union army and navy had effective control of the west coast of Florida, and many cattlemen retreated inland and formed the “Cow Cavalry” as a defense against Union troops. One of the wealthiest members of the Cow Cavalry was Jacob Summerlin. Summerlin purchased the Blount property in 1862 and donated a large parcel of land to build a county courthouse, two churches and a school. Later that year, the town which had been known as Fort Blount, Peace Creek, Peas Creek, and briefly Reidsville was permanently renamed Bartow in honor of Francis S. Bartow, the first confederate officer to die during the war. Like much of the south, Bartow recovered slowly from the war as inefficient and often corrupt Reconstruction governments did little to rebuild the fractured infrastructure. The first Polk County Courthouse was built in 1867 and this did solidify the city’s position as county seat. Although Florida formally rejoined the union in 1868, Reconstruction did not end in Florida until 1877. The 1880s and 90s were a period of growth for the city of Bartow; from 1880 to 1900, the city would grow from 386 residents to 1,983. On July 1, 1882 the town was incorporated as a city. In 1885, the Florida Southern Railroad, a north-south route from North Florida to Southwest Florida opened in Bartow. A year later, the Bartow Branch of the South Florida Railroad which connected Tampa and Orlando was completed. The railroads would become a catalyst to the growth of the area; during the Spanish American War, the Bartow rail yards became a crucial part of the supply line headed for troops in Cuba. In 1887, Summerlin Institute, the first brick schoolhouse south of Jacksonville was built. By the turn of the century, Bartow had become the most populous city south of Tampa on the Florida peninsula – larger than either Miami or West Palm Beach. As the city grew, a number of industries moved into the Bartow area. In the first few decades of the 1900s, thousands of acres of land around the city were purchased by the phosphate industry and Bartow would become the hub of the largest phosphate industry in the United States. Polk County was the leading citrus county in the United States for much of the 20th century and the city has several large groves. In 1941, the city built an airport northeast of town. The airport was taken over by the federal government during World War II and was the training location for many Army Air Corps pilots during the war. The airport was returned to the city in 1967 and renamed Bartow Municipal Airport. “Will pay the bearer twenty five cents in current bills when presented in sums of five dollars and upwards, Ft. Blount, FLA.” UNIQUE!